The Twitter Art Exhibit Opens Tonight! I donated this lovely little watercolor painting to the Twitter Art Exhibit in New York City the sale of the donated paintings in this exhibit from artists all over the globe supports Foster Pride NYC. The opening is tonight March 31, 2016 from 6 pm to 8:30 pm at the Trygve Lie Gallery located at 317 E 52nd St. NYC. The show runs through April 21, 2016. All of the postcard sized art is handmade and the price is only $35 each. Here's your chance to get a fabulous piece of art at an affordable price and support a wonderful charity, Foster Pride NYC. 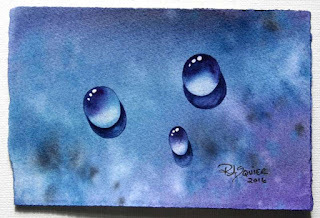 Buy my painting Dew Drop Trio in Blue at the opening! Attend the exhibit and follow us on twitter!